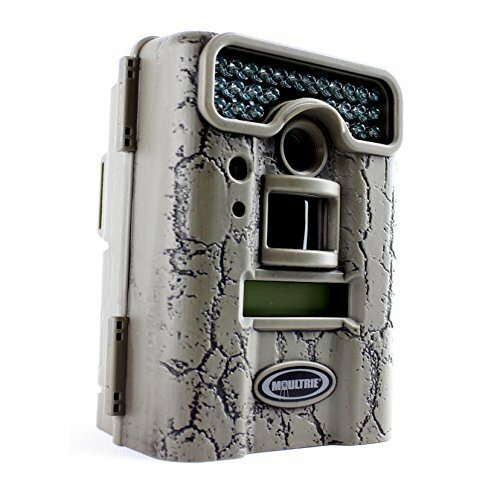 Moultrie is serving you the best trail cameras for many years, and up until now, it continues to discover, develop, innovate and provide the best trail cameras for you. Now it continues to upgrade the best cameras in the woods. No matter where you are, you will always have eyes and be updated on your perimeter, and no matter who you are, Moultrie mobile will keep you recorded every single minute. This camera has a 24 led for 70 foot long-ranged infrared nighttime illumination, 0.7-second trigger speed, time-lapse mode, easy interface with password protection, up to 32GB SD memory card, backlit navigation buttons that makes low-light setup easy and integrated cable loop with Python cable compatibility. Take note that A-30 is a mobile compatible, so you can still have shots even if you’re away from the perimeter. These features will surely make you sure that it will capture beyond the sight of your eyes. This is an excellent camera for wildlife events and even in security purposes. You will be impressed by it also takes videos with sound quality that will surpass your expectation. It captures precisely those moments that you can’t catch in your phone day and night. Even if it is dark, you can still clearly see the events of your pets. Also when it captures, it is not too disturbing, like it does not create some bright, white flashy light and has no sound when taking that will take the attention of the animals. It is very convenient for those who are always not at home working every day because you can still see what is happening to your pets and in the wild. It is also effortless to use and install like you don’t need some help of an expert because you can setup it on your own in just a minute. It will undoubtedly prove to you that it will go to make your job done with watching your pets and capturing some animals in the wild. While you enjoyed reading the positive side of this product, let’s get you to a few of the negative. 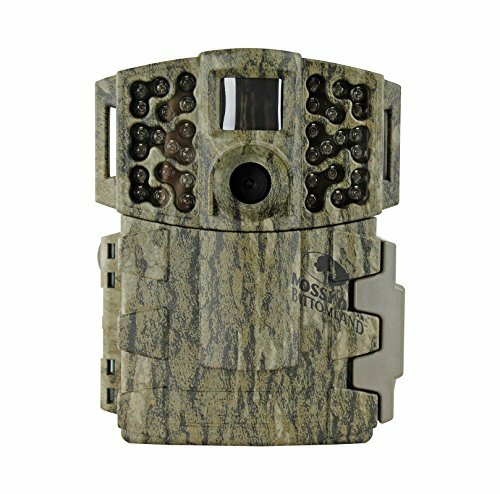 For this one, it has no time lapse options and does not detect some small creatures in the far distance, so if you are planning to capture small animals don’t buy this product unless you are in a very close perimeter. Moultrie M-880 provides incredible features and quality for you. It has 8.0 megapixel Low Glow infrared mini cam, less than the 1-second trigger that moves like lightning for you, up to 100-ft night range, the illumi-Night sensor provides bright, clear nighttime images, and a motion Freeze reduces nighttime blur. With these features, it will make your recording even better than before. 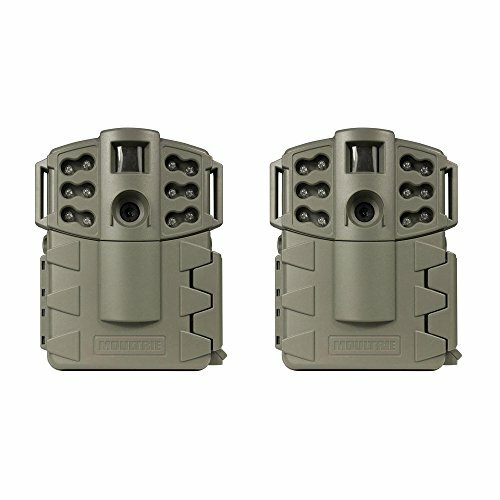 M-880 Low glow game camera takes excellent videos even in the dark and whatever season, weather and temperature it is. The batteries last long also if you set it in a video mode. The product uses standard and cheap AA batteries, so you will not have difficulty in replacing it when it drained. It also does not make some noises that will disturb the animals with any mode you choose; you cannot even notice the infrared light when it captures. So you will surely know secretly when someone is invading your house if you are going to have it for the safety because it also blends into your surroundings. The model also chops off the upper 1/4 of the frame, so it appears like you have a wide-frame aspect ratio with your photos which is so unusual than the average camera. The camera itself is less sensitive to those false triggers created by the environment like the winds and other plants that touches it. When it captures, it will indicate there on the frame the temperature, mode phase, time, date, and the camera ID. The wrong side of this product is thee; with the “freeze” motion thing on some of the detail is lost at night. Its 48″ strap only allows for tree truck under about 15″ in diameter. Some buttons of the same products are unresponsive, so you will have difficulty on pressing it. It also has corrupt files, like when you have photos or videos, some of these are unreadable. The product will surely exceed your expectations because it works great. No sweat in setting up the product, and with just a minute you may now use it. The product will make you keep track in your area all day long, and what is going on with the animals in the wild. The quality of the photos that was taken is for sure in a useful feature both day and night. You can still clearly see what is going on 30 ft. Away from the camera. Not a waste of batteries, even your used battery will last for how many weeks or a month. It is beneficial also for security purposes; it will read some plate number from the cars clear and bright. The problems that you will be going to encounter with this one is that; when you are going to put the camera in frigid weather(when winter comes) with 10 degrees and below, it will not work like it usually does. The photos that were taken at night are not that good compare at daytime. Too many false pictures were made because of the wind and other things that will touch the camera. When you are going to remove the SD card, it is hard to get even if you already pressed and released it. After that, everything else works great for your job to be done. A-5 has a 5-megapixel camera resolution, with less than 1.5 seconds of trigger speed, 40 Ft detection range enough to have a shot of your perimeter. It also has a 50 Ft of flash range, long-Range nighttime infrared, redesigned from the ground up. The A-5 Gen2 offers Moultrie quality at a value price – giving you the most for your money and your hunt. The Moultrie Gen2 A-5 has been updated with a new look, shorter delay options, and Multi-Shot mode to ensure you are getting the most out of your game camera. Camera resets rapidly after image capture, taking under 1.5 seconds after a motion trigger to the camera if it is fully ready to detect motion and capture valuable field intelligence. The A-5 can be set for 10-second, 30-second, 1-minute or 5-minute delays – all with the flip of a switch. Just like any other Moultrie cameras, A-5 is also easy to use and install as learning alphabet. It takes explicit photos for hunting and your security. It uses lithium-ion battery which is a rechargeable one that lets you save some money and to charge it instead of buying another eight pieces of it. The wrong side of the model; the product only covers 10 feet instead of having 40 feet detection range as mentioned in one of its features. If you do not know how to angle cameras, then you can’t have the picture that you expected. Only the daylight photos are great and the night mode photos are in a low quality due to lack of light. The motion detector is also so slow or cannot to detect your moving subject. 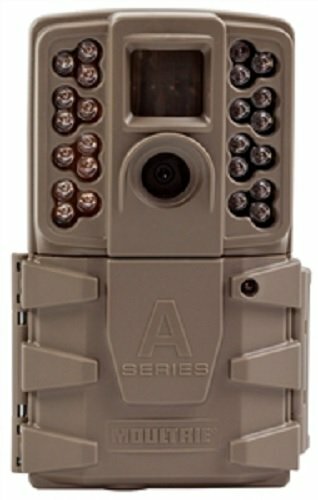 This camera would be great only in daylight and for a massive game, but not for fast moving small animals and security purposes if you are planning to buy this model for your safety. The A-5 gen2 Low glow infrared camera has a function almost the same as the Game Spy A-5 Gen 2 Low Glow. 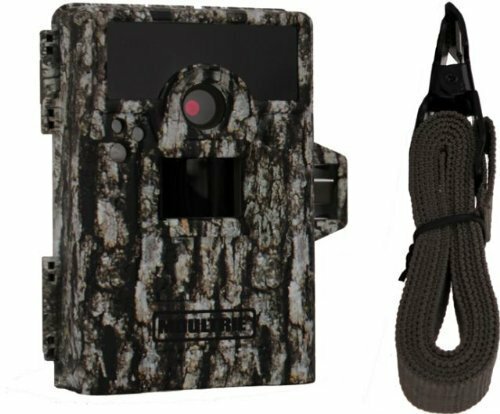 This one has 5.0 MP Camera, Green of 5.0 megapixel Low Glow infrared game camera which is not that kind of a high resolution. It also has a 50-ft of nighttime illumination range (AKA flash range), long-range 850nm IR LED Infrared. A Multi-shot Mode that captures three consecutive photos with a one second delay between each picture to make sure that you would not miss some events, day and night video clips (640×480 video), and captures 16,000 images per 8AA batteries. The model is great for security purposes and hunting activities. This one will help you to make your job done efficiently with no sweat. 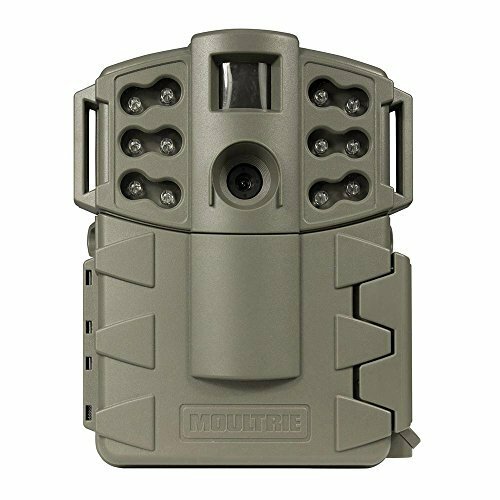 Just like any other Moultrie product, it is also easy to setup, with a maximum of 5 minutes you may now use it and start recording or taking photos of your area. It works on what weather you have; during storms, wind, rain, and heat very high. The product also covers excellent range to record for your place and wild activities. It took great photos and color combination of the scenario. You can use it for how many years so that you would not miss some events of the animals in the wild area. It has long battery life even if you set it which mode you wanted. Some negative side of this model is that; it gives battery light instead of having battery percent display, so you can’t quickly determine if the battery is almost drained. The rubber seal around LCD screen and the battery compartment is not high enough, so you need to do some things to make the rubber seal stronger. In some instances, batteries fall out, so you need to tape it in to make the product work. Moultrie A5 is affordable and powerful for taking photos of both animals and even people around your area. 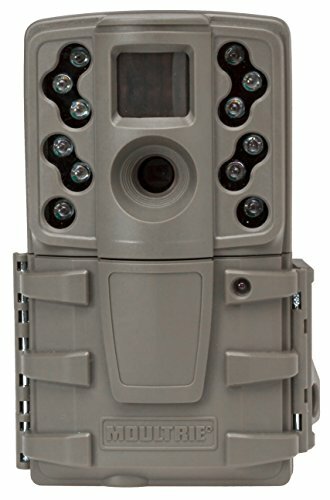 It has 5.0 megapixel Low Glow infrared game camera, 50-ft nighttime illumination range (AKA flash range), Long-Range 850nm IR LED Infrared. It also indicates on the frame the Moon phase, the time it was taken, date and camera ID stamp, and picture delay 10 seconds, 30 seconds, 1 minute, & 5 minutes. This model of Moultrie has three times of its battery life that will make you save money on buying AA batteries. Its trigger speed also will not make you going to miss some happenings in the surroundings. The photos were excellent, even the black and white during the night will get you to see still clear, will give you decent pictures and information about the critters in the area that you want to monitor. It captures excellent photos as well as videos and does not upset or disturb the activities of animals through its flash but it does have infrared flash. You may feel that the models are somewhat weatherproof and watertight that no matter how high the storm in your place you can still find your Moultrie A5 untouched on where you place it. A5 is just so sensitive to its settings for the motion trigger that will give you many false photos. Sometimes the limited range of night pictures can be an issue. The shortest delay setting is 1 minute, so no matter what is going on, you cannot take pictures any faster than 1/min. Takes too long to wake –up, that lets you miss a lot of action at that time because there are so many things that will happen within just a minute especially those fast moving animals would not going to be part of the frame. 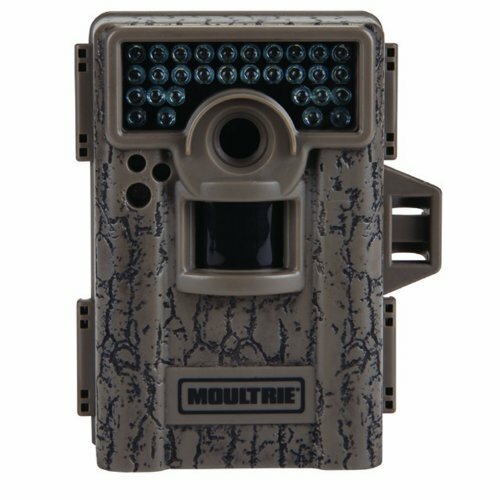 The Moultrie 990i has 10.0 megapixels no glow infrared mini camera, less than 1-second trigger speed that will capture surely some fast moving animals, has a range of up to 70 feet at night, the illumine-night sensor provides bright, clear nighttime images and a motion freeze that reduces the nighttime blur. The model has a dimension of 7.5 x 9.5 x 5 inches and 1.9 pounds so that it may be a handy model. The right side of this product is how sensitive the trigger is, that you can be able to get reasonably repeatable detection up to seventy feet away during the day just like what in the features has presented. The “black-flash” works great, you can’t surely see the light, and it provides excellent infrared illumination for black and white nighttime shots. Its setup screen shows live video which makes it easier for you to set up the camera. It captures nice photos both daytime and nighttime as well as videos. It has a “No Glow” camera; it does not produce flashy lights and red lights that may disturb the animals. As the model has excellent trigger sensitivity, it captures random shots or empty frames. The camera does not take 24 frames per second as claimed instead it just makes 10-15 frames per second. You can see it in the videos and evaluate it one frame at a time. The problem of the time lapse will only run during the day. It starts fifteen minutes during sunrise and also stops fifteen minutes before sunset. So you can’t do some dry-run 24 hours. There is also a problem with the SD card; it slides in and out because it has no spring latch on it. The model is more on exploring some options if you want to work well. Moultrie M-880i features have an only 8-megapixel resolution, has less than 1-second trigger speed, 50 feet detection range, 70 feet flash range, invisible 940NM IR LED flash technology. To make it more new to you, it has a unique “quick start” menu setting that makes the M-880i Gen2 straightforward, easy and fast to set up. Features have an invisible IR LED technology with 36 powerful LEDs providing excellent undetectable illumination range of up to 70 feet, 8.0 MP high-quality images with 16:9 ratio. Packed with a trigger speed of under 1 second, as low as 5-second delay setting and multi-shot image capture. The model is elementary to use, and the programming is also stress-free, you may use its “quick start” menu if you find it difficult to program or you can customize the setting. It takes excellent photos, its motions detector and IR flash have good ranges. The invisible IR LED flash is literally can’t be seen as presented in the features. The invisible flash camera takes excellent night pictures and best to use in sensitive areas where you don’t want to capture the attention of the animals. The time-lapse and motion detect mode allows you to catch animals that may not trigger the motion detector. Takes also very high-resolution pictures during daytime even the 4MP way can be enough for your purpose. The night pictures are slightly dim, and the so bright sunlight can wash out the image, you may get an extreme contrast that you can only see shadows on a sunny day. The video has a 1-second delay between the sensing and the start, and sometime you may record a no audio video. It may confuse you for the customs start and may feel some difficulties. You may use larger SD cards, but it may affect the speed. 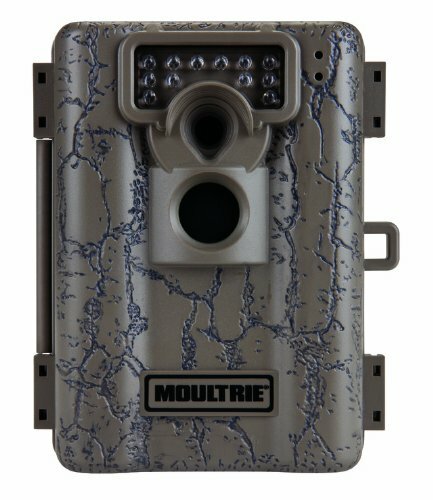 This Moultrie spy camera has a night range that will cover up to 50 feet. It has a temperature, moon phase, time, date, and camera ID in every photo that it takes, quick fire continuous shooting mode captures up to 3 pictures per second, picture delay to 15 seconds, 30 seconds and 1-60 minutes and has three picture resolution and two video resolutions. This model is easy to set-up and will work quite well for you. Produces excellent quality photos during daytime and the IR nighttime pictures also are decent enough for your needs. The detector is sensitive enough to capture animals and to move objects in the range of the model. Take thousands of photos or frames in a single batch of batteries and a couple of videos. You will know if the cells are near because of it will readout how many percents it is. There is a 30-second countdown delay from the time you turn it on to give you time to get out of the frame and capture a photo that you wanted without wasting some frames. The time lapses are just fine, not for the high-level professions. Does not bother all kinds of animals when it captures. The batteries last long that works for at least six months than the other cells. It depends if you are always taking videos because videos waste more battery the pictures. The nighttime sensing range seems to be higher than the advertised range. Its exposure time is relatively slow. Too much sensitivity is not right, to the point that it will just give you some no use frames. You can find that the battery indicator is not that reliable, so you still have to monitor it. Nighttime frames are not that perfect, it has some blur on the frames for fast moving animals but can be managed. 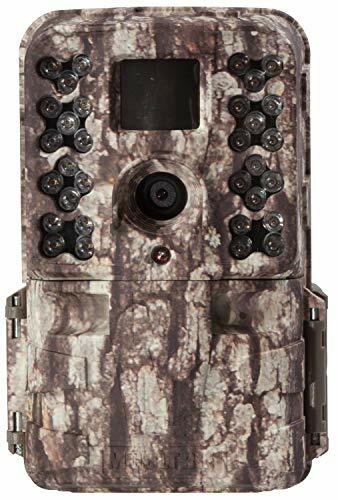 The M-series is a tiny model and has a 16-megapixel camera, 0.3 trigger speed, 1080P for videos, has Moultrie MCG- 13181 M40 game camera and accessories and is a mobile compatible, so you can transfer your frames or watch the videos on your mobile. Fun high technology toy for some and might be a severe investigative tool to others. The nighttime images are decent enough for what you expect, and infrared light is working very well to not capture attention f the animals in your barn or the wild. Has solar battery backup that was added to each model type, to make sure that it will still run with the help of sunlight. Gives beautiful pictures and far better in quality, and reaches 60 feet. The case design is compact and robust. No horrid and white-out in the most crucial dawn and dusk periods. You can bring the model into the desert, and it will still work even in 56 degrees Celsius with no issue. You can make great movies using the time lapse mode and edit it with those not so pro editors with a fantastic outcome. The new menu for this camera is terrible than the last model. You may experience that the water from the rain will enter the model inside the camera, so it is not a waterproof camera. For the instructions, it is no tremendously clear for the consumers. You may still read the instructions, again and again, to make it for you to set and use the model quickly.